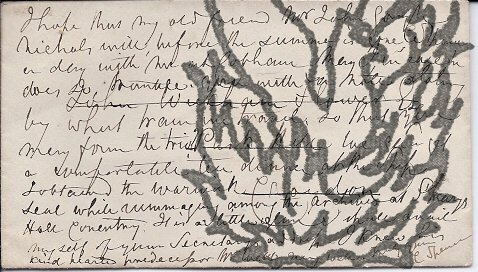 The letter is of 23 lines, written on the front and back of an opened envelope with the cancelled address of 'John Wickham Flower Esq, Park Hill, Croydon'. In good condition, on aged paper. The rear of the envelope carries a good impression of a red wax seal, and the letter begins: 'My dear Sir, I had written this letter having obtained my object through my friend the York Herald and I still send it on account of the Seal which was the counter seal of Richd Neville Earl of Warwick killed at the battle of Barnet'.